A brush and a bit of cream may suffice when it comes to basic leather shoe care. But what if the leather sole lets water seep in, or someone spills red wine onto your shoe, or you discover small scratches in the upper? Comprehensive shoe care requires a bit more, which is why we have assembled this premium shoe cleaning kit for dark brown shoes. This kit contains everything you need to deal with the aforementioned scenarios, as well as for other ones you and your shoes may face. Moreover, we have taken care to only include the best of the best, with a special focus on natural sustainability. We avoid products consisting of questionable laboratory-made chemicals. 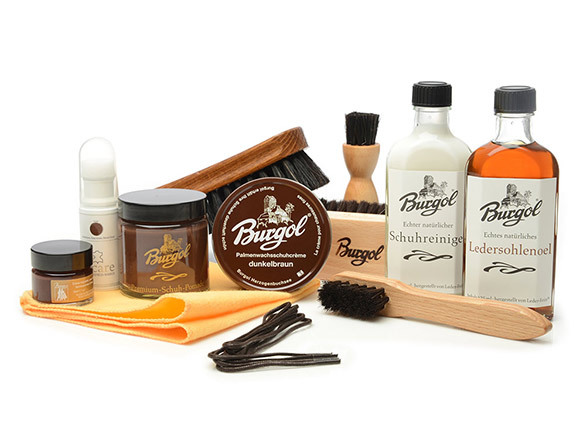 Instead, the items in this dark brown shoe cleaning kit are made of natural substances, created with traditional handicrafts: the shoe wax contains gentle balsam turpentine, the shoe cream boasts lipid-restoring oils and waxes, the premium polishing brush features soft, hand-plucked Cashmere goat hair bristles, and the handles of the other brushes have been carved from German wood. 1 Shoe Polishing Cloth. This square shoe polishing cloth measures 30 x 30 centimetres and is used to apply shoe cream and shoe wax to the shoe upper. Alternatively, it can be used to polish the shoe. 1 Burgol Shoe Cream in mid brown. This jar of high-quality mixed emulsion brightens faded, dried-out smooth leather shoes and restores satiny shine. Oils and waxes restore lipids to the shoe leather and refurbish it with depleted nutrients, while natural colour pigments impressively revive leather colour. 1 Burgol Shoe Polish in dark brown. 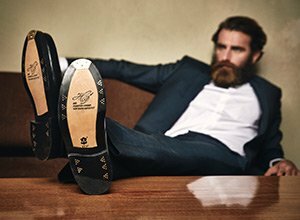 A premium shoe polish made using a 90-year-old recipe. It contains turpentine balsam and natural waxes, which, when the shoe polish is buffed into the shoe, create a beautiful high shine. Further it also contains carnauba palm wax for a waterproofing effect. 1 Polish Dauber – dark. Shaped like a paintbrush, this applicator brush, like the polishing cloth, is used to apply shoe cream to the shoe upper. It is particularly well suited for structured leather, and easily reaches parts of the shoe that are difficult to access with the polishing cloth. Made in Germany using German beech. 1 Welt Brush – dark. This premium welt brush is a crucial component of shoe care. This is the only tool that allows you to treat the crevice where the sole meets the shaft, a spot that is subjected to a lot of strain. Featuring fine horsehair bristles and a beech handle, this brush is built to last. 1 Polishing Brush – dark. This horsehair brush from Solitaire is perfectly suited for pre-cleaning the shoe upper—use it to remove dirt and dust from the surface of the shoe before proceeding with the care process. Failing to do so can cause small scratches to form in the leather when you apply care products. 1 Goat Hair Brush – dark. This premium Burgol goat hair brush features hand-threaded bristles made from the fine, thick hair of free-range Cashmere goats. Use it to simultaneously remove dust and excess cream and polish the shoe. The result: a dirt-repelling, shiny, and smooth shoe upper. 1 Leather Sole Protector – 125 ml. Leather soles are vulnerable to moisture, and, in the winter, rock salt and gravel. When subjected to these factors, soles can quickly become fragile and brittle. 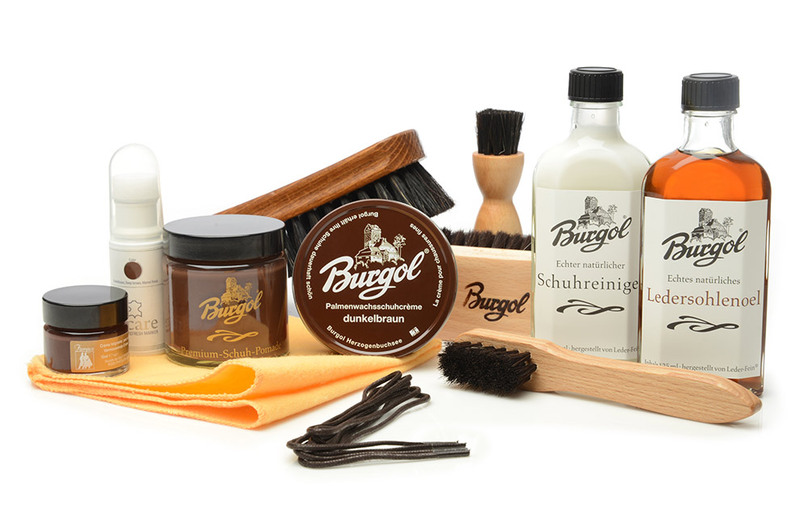 This leather sole protector from Burgol helps prevent premature sole erosion. It saturates the leather, increases its water resistance, and keeps it from abrading. 1 Sole Edge Dressing in dark brown. The shoe sole and heel accumulate the most wear and tear through everyday use, i.e., walking and standing. The colour on these parts of the shoe easily flakes off—for example, when you bump your shoe against something. Sole edge dressing lets you restore sole and heel colour. 1 Repair Paste in mid brown. Everyday wear causes small scratches to accumulate on leather shoes. This can result from pebbles hitting the upper, knocking your shoes against the edges of stairs, or being stepped on by incautious fellow men. With this repair paste from Famaco you can eliminate minor damage without leaving behind any residue. 1 Pair Replacement Shoe Laces in dark brown. We have included a bonus pair of dark brown replacement laces in case your shoe laces ever tear. Purchasing this dark brown shoe cleaning kit saves you about 18%, as compared to individually purchasing each item contained inside.